Tyreshack are an independent tyre and wheel alignment centre based in Southampton offering a range of tyre services. Our relationship with Tyreshack has been longstanding as we built their website, however, after the company spent much of their marketing budget with Yell and with hardly any return on their investment the company made the choice to invest in search engine optimisation (SEO). From January 1st 2018 – 31st December 2018 Tyreshack received 47 user referral clicks direct from yell.com, with 37 of those being new users. 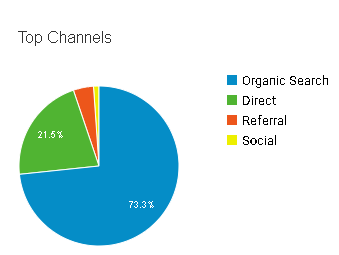 This accounted for 0.35% of the total traffic to the website for the full year which is an extremely low number of traffic for a company spending money on gaining these referrals. I am really starting to see big improvements across these search terms in the Google rankings … Great work!!! The main challenge when working on Tyreshack’s SEO campaign was the high search volume keywords they wished to rank for; the general rule of thumb is the higher the search volume, the more competitive it may be. However, with the use of a full website setup including optimisation of their meta titles and descriptions and the use of additional content the website ranked in position 3 for its most important keyword, Tyres Southampton by November. After over 4 months of working on their SEO campaign Tyreshack are ranking in the top 10 and higher (page 1 of Google) across their key search terms and are still continuing to grow. The company has recently expanded their service offering and therefore we are looking to help increase their search engine exposure for this and ensure they are ranking in the top positions.